We pride ourselves on the variety of our dress shirts, which feature just about every color, pattern, cuff and collar style imaginable, not to mention fit and fabric choices. And this year, thanks to their increased popularity, we’re proud to unveil a wide array of spread-collar options. 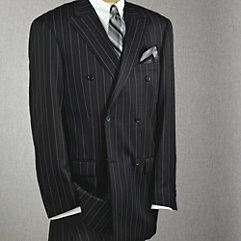 Luxury, variety, creativity and of course value — we’ve got it all in our dress shirt collection for Fall 2012. Hear our Dress Shirt buyer Michael Contreras about what’s new. PF: What are the new color combos for this season? M: We have a lot of really great transitional colors for fall, starting with our blue/tan collection. It includes one of our most popular shirts, now with French cuffs, and I’m really excited about these great transitional pieces from summer to fall. For those who want something brighter, we put together a blue/orange collection. What Collar Style Is Right For Me? Make sure to visit our new and updated dress shirt collar guide to find the shirt collar that best suits you and your needs. Dress shirt collar styles are one of those topics that a certain kind of menswear pundit relishes taking on, telling you that you should match your collar to your facial structure. And so portly guys are advised to eschew rounded club collars, and skinny guys with gaunt features shouldn’t wear spread collars. Nonsense. We strongly encourage you to wear any kind of collar you like. What’s more, we like diverse wardrobes, and encourage you to try every collar style we offer to add maximum variety to your work wardrobes. 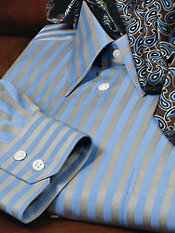 When it comes to business dress, suits are supposed to be your big investment and ties are your “personal statement.” That leaves dress shirts as one of the things boring dressers pay little attention to, never venturing beyond the safe boundary of blue and white, while stylish dressers relish choosing shirts with the same care they choose a handmade silk tie or rakish double-breasted suits in a Prince of Wales plaid. 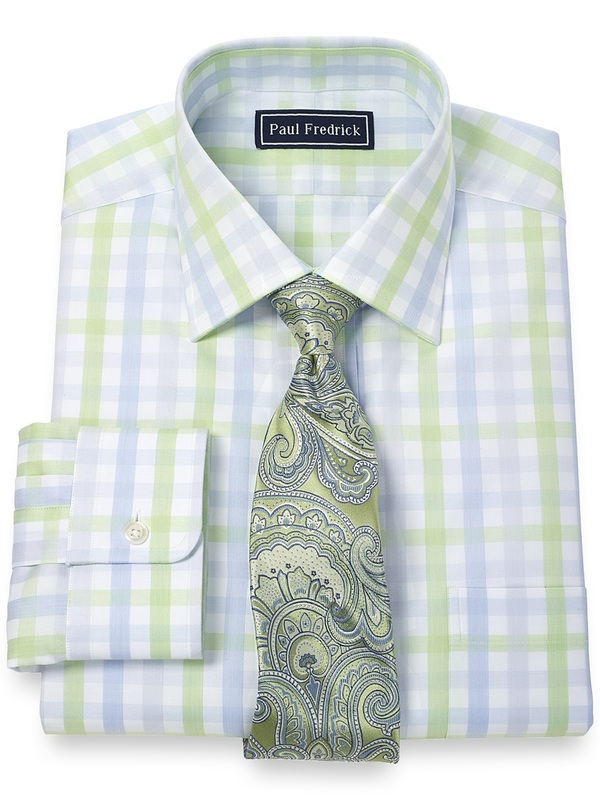 And with dozens of colors and patterns to choose from, there’s no reason why selecting your shirts can’t be the most fun you get out of procuring your clothing from Paul Fredrick. There are certain rules — more like traditions, really — that govern menswear. Sure you’re free to wear what you want, and we’d like to think we have something for every mood or occasion, but we also think that certain gestures became traditions because they have merit. Here are a few of them, all centered on the theme of buttons.